WPlus9 is celebrating its 4th birthday and there’s lots of inspiration happening over on their blog. I wanted to use the Quilt Cuts die for the current Step It Up challenge. I’d seen Dawn’s great video here with tips on using this die with adhesive sheets and it certainly does make the process of putting the “quilted” square together very easy! I used an old silver brad from my stash to finish it off. 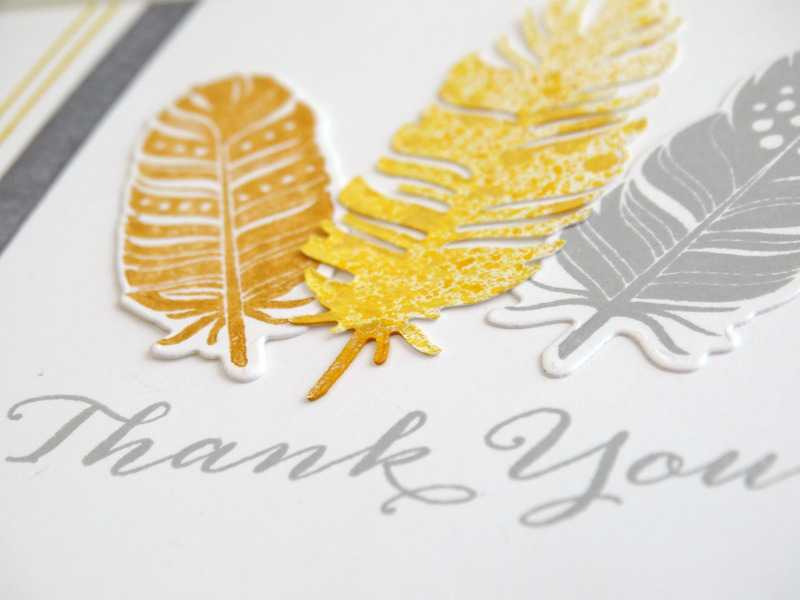 The sentiment is from WPlus9’s Fanciful Feathers stamp set and was heat embossed in white. I added some interest to the background panel by spritzing it with Dylusions White Linen ink spray (love this stuff! ), a few sequins and finally some faux stitching with a gel pen to keep with the sewing theme. Other: Ranger Dylusions White Linen ink spray, Hero Arts white embossing powder, Signo Uniball gel pen, sequins, Stampin Up silver brad, Silhouette adhesive sheets. 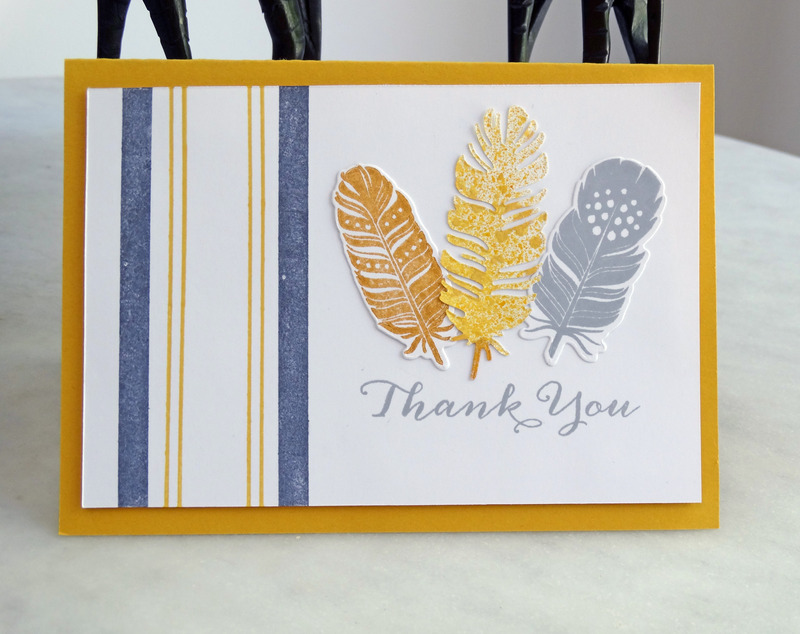 Here’s the second thank you card I made using WPlus9’s Fanciful Feathers stamps and coordinating dies, this time along with the ikat stamp from Borders & Background 1. It was such fun putting the card together. 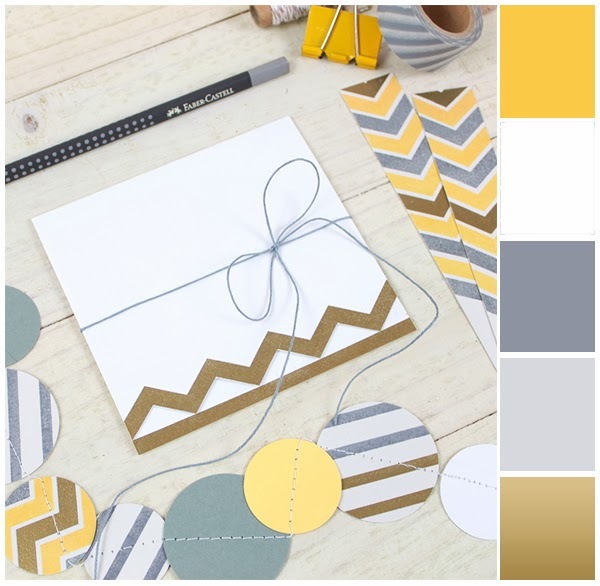 I love the chic-ness of this week’s Monday Mood Board with its playful pop of yellow. It provided me with the colour inspiration for the card. I stamped the ikat border in Stampin Up Crushed Curry and Smoky Slate. 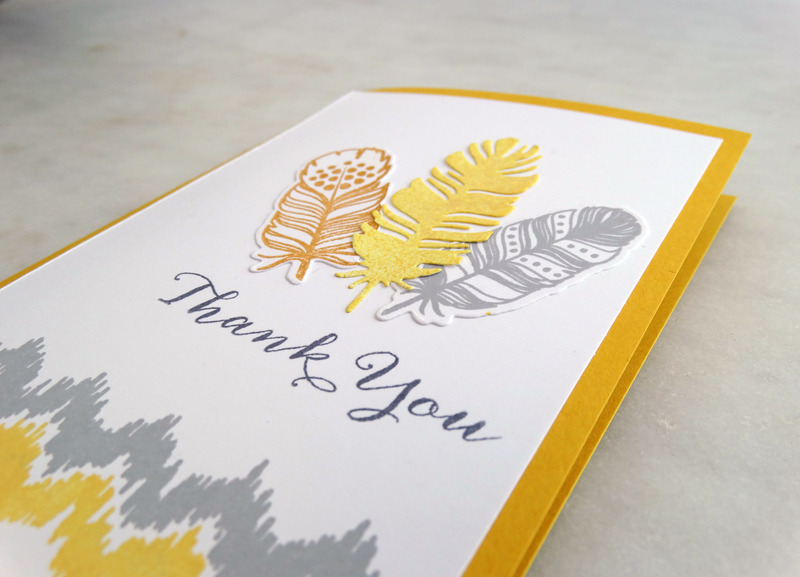 I die cut the feathers first, then stamped the two smaller images using Memento Luxe Peanut Brittle and Smoky Slate. The larger feather was spritzed in sunshine yellow. Ink: Stampin Up Smoky Slate, Basic Gray, Crushed Curry, Memento Luxe Peanut Brittle, Studio Calico Mister Huey Sunshine Yellow. 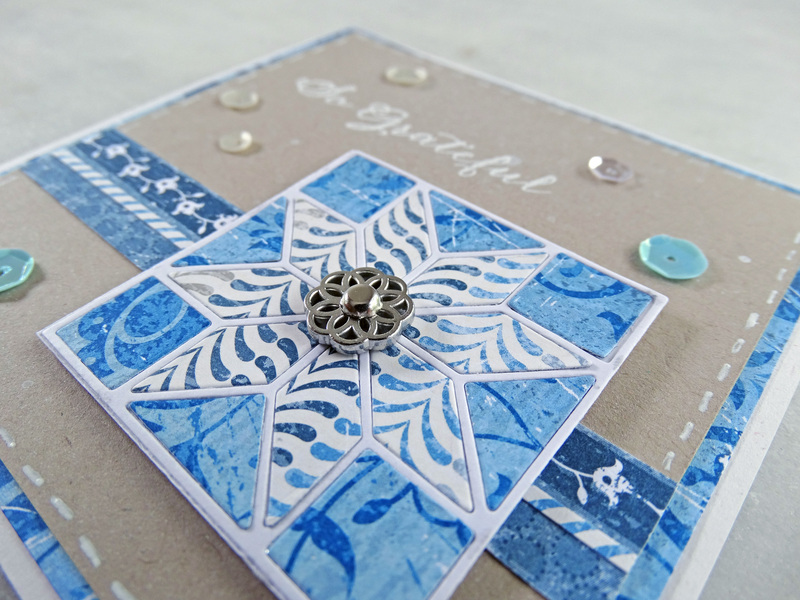 Card: Stampin Up Crushed Curry, Whisper White. The stripes on the left of the card were stamped using images from WPlus9’s Country Charm set (I find myself reaching for that set all the time!). Next I die cut the feathers. Lining up the images on the die cut shapes is super easy. 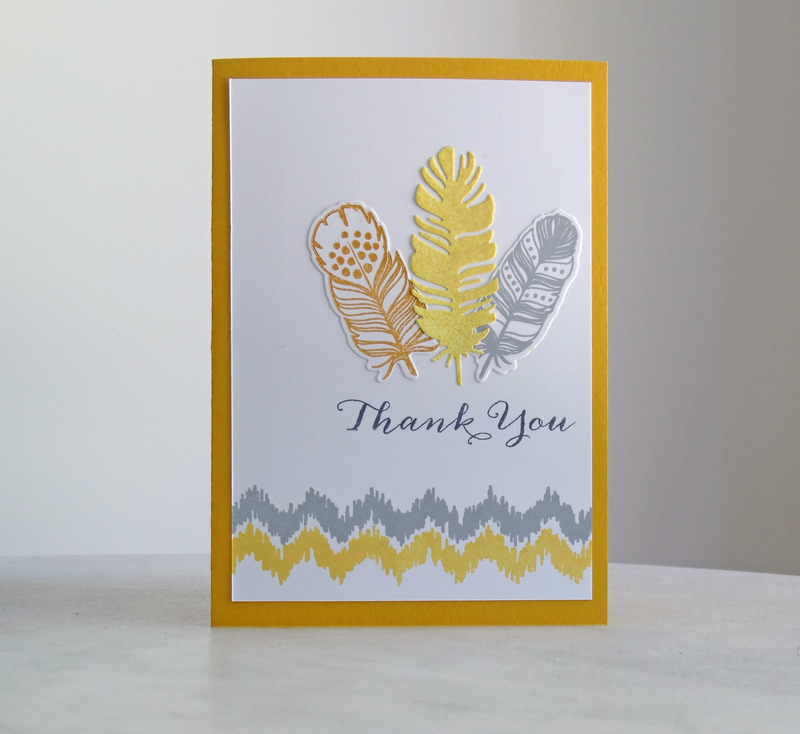 I stamped the smaller feather images in Memento Luxe Peanut Brittle and Stampin Up Smoky Slate. The larger feather is lovely and delicate and I wanted to keep that feeling when it was coloured, so I lightly spritzed it using a colour spray. To adhere that feather I used a Quickie Glue stick – much easier and neater than using a tape runner.